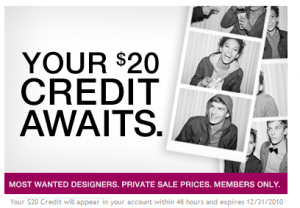 Kate and Oli: Get A $20 Credit To Rue La La! So, by now I've written about Rue La La here and here and let me assure you, I've had to restrain myself from writing about it more often. But I just love getting a good deal! And I love sharing those good deals. So here's another one! 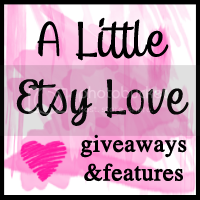 Right now, when you sign up for Rue La La, you will get a $20 credit! This is only good until 10/25/10. It will take about 2 days to show up in your account after registering, and will be available for use until 12/31/10. Believe me, with holiday shopping coming up, you will want this credit! I already have over half of my Christmas shopping done, due to sites like Ideeli, HauteLook, One Kings Lane and of course, Rue La La! it applies to international users as well! i emailed them earlier regarding this, let me double check for you! i'm so sorry, this is not open to international users. they said they hope to open it up globally in the next year, though! :( thanks for reading! amazing! I'm going there now!